Peanut butter has got to be one of my favorite foods. I practically lived on it in college (that and Nutella) and have baked my fair share of peanut butter cookies. Like I said here, peanut butter cookies are my weakness. In general, I prefer the homemade variety to any bakery’s (although Momofuku Milk Bar does have a killer peanut butter cookie for any of you New Yorkers out there). 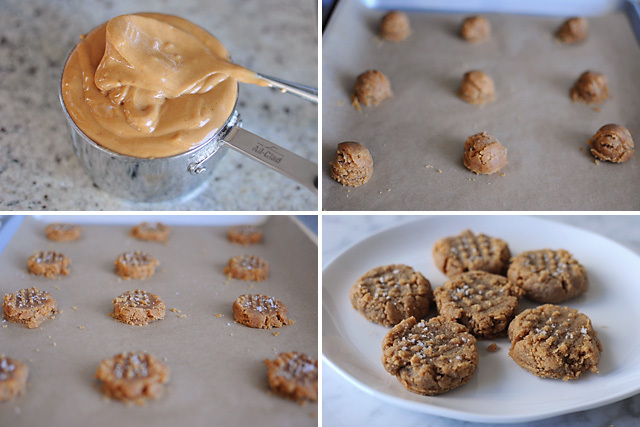 I’ve got a number of tried and true recipes that I turn to when I’m looking for a peanut butter fix, but I’m always intrigued by a new recipe and this one caught my eye because it’s flourless. No flour here–just peanut butter, sugar, vanilla, salt, and an egg. 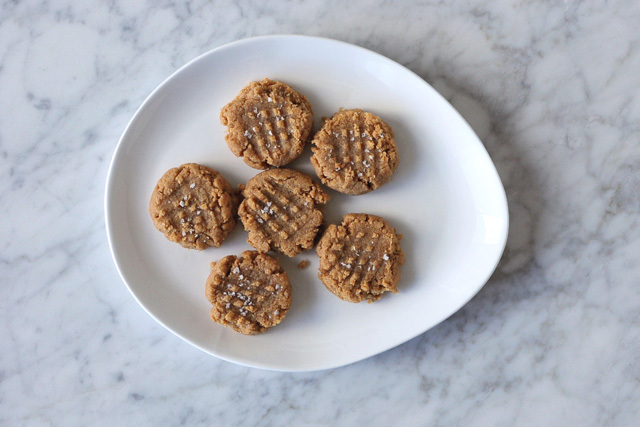 Simple to make and easy to eat… these are my kind of cookies. With so few ingredients and no flour, they are rich, dense, and really packed with peanut flavor. A touch of Fleur de Sel on top doesn’t hurt either. Preheat the oven to 350 degrees with the oven racks in the upper middle and lower middle positions. Line 2 baking sheets with parchment paper. In a large bowl, mix together the peanut butter, sugar, vanilla, and pinch of salt until well combined. Add the egg and mix well. Use a small cookie scoop or a tablespoon to portion out the dough onto the prepared cookie sheets with 12 cookies per sheet. Then take the tines of a fork to make crosshatches on each cookie (wet the fork with water to prevent sticking) and sprinkle the tops with a little Fleur de Sel. Bake for about 10 minutes, until golden around the edges. Let the cookies cool on the baking sheets for a few minutes before transferring them to a rack to cool completely.